Jesse Popper and Doug Rideout won their second straight race on the Indiana Sired Fair Circuit Saturday, Sept. 29 at the Harrison County Fairgrounds in Corydon. The two-year-old trotting colt is now four for nine in his brief career. Starting from post three in the second division for freshman trotting colts and geldings, Rideout slid Jesse Popper over to the inside path behind V Key’s Star Burst and Mike Peterson. They maintained the lead until the three-quarter mile marker before a costly break took them off the lead and allowed Jesse Popper to show his best stride. The Sing Jesse Sing gelding kicked into gear and rolled away from the field for a nine and one-quarter length lead at the finish in 2:10.1. Piggie Pooh Pine and Jack Kieninger finished second over Doc’s Swan Song and Don Eash for third. Jesse Popper is trained by Brian Barnes and owned by breeder Benjamin Graber of Woodburn, Ind. He is a half-brother to Jailhouse Jessica, who earned nearly $200,000 in her career with a best time of 1:54.2. Wins were pretty well spread out on the 15-race card. 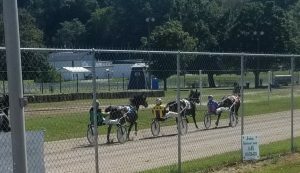 Several drivers had doubles, including Don Eash, Marcus Hill, Lester Raber, Doug Rideout, Mike Hollenback and hometown favorite Charlie Conrad, who scored back to back wins in two of the three divisions of the two-year-old filly pace with Primo Extremo and Play To The Crowd. For one driver, one win was enough. Inga-Lill Karlsson, longtime team member of the Don Eash Stable, scored her first career driving win behind Woodside Banjo in the lone three-year-old colt pace. Karlsson, a native of Sweden, placed Woodside Banjo on the lead and never looked back, scoring the win by three-quarters of a length in a time of 2:03.1. Eash owns and trains the Always A Virgin gelding. Karlsson received her driver’s license in 2017 with two starts. She won her first career race in her 13th career start at the Harrison County Fairgrounds.